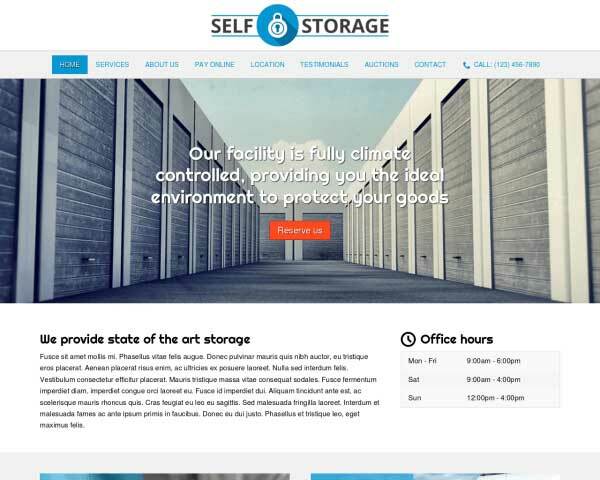 When it comes to building a professional website for self storage facilities there's no better solution than the Self Storage WordPress Theme. Why? Because we've created a theme specificially for this type of industry. Unlike our competion, who think self storage facilities and moving companies are one and the same. There are very view Self Storage WordPress Themes in the market and I've seen them all. After years of being a premium WordPress theme supplier what we always strive for is to resemble as closely as possible the finished website the actual business owner would want. In this case a storage facility owner. And where our competition mainly come up with hollow generic shells of WordPress themes, we passionately design and flesh out the theme after having done extensive research into the specific industry. That's the reason why our Self Storage WordPress Theme comes with a look-and-feel befitting a storage facility website. Complete with a Storage Unit Reservation Form, a division between storage and moving services on the homepage, testimonials, trust icons, detailed storage location information, and of course web design staples like a contact form, social media integration. And if that's not enough, we've wrapped it into a state-of-the-art wrapper. Which includes our tried-and-true website builder tool and the turnkey installation. Installing this theme means you get all of the content you see in the demo pre-installed on your WordPress installation, which will speed up your web design workflow tremendously. And if you're looking to host it with us, you can, with a free domain name, including all the licensed stockphotos and an automatic backup system. Yes this is truly the definitive solution for storage facility owners who want to build a site. The most important element of the Self Storage WordPress Theme is if it focuses on lead generation. And it does with the integrated Storage Unit Reservation form, which is a fully-editable lead generation form. The Self Storage WordPress Theme provides you with a plethora of tools to share the right kind of information to your website's visitors. Among other is the neat display of your office hours. The main service section of the Self Storage WordPress Theme's homepage is currently divided into a section for people looking at your storage units and peopl who're interesting in storage options related to moving. You can share your affiliations and creditations with the in-built trust icon functionality. They can easily be expanded to convey your professionalism in the storage unit industry. 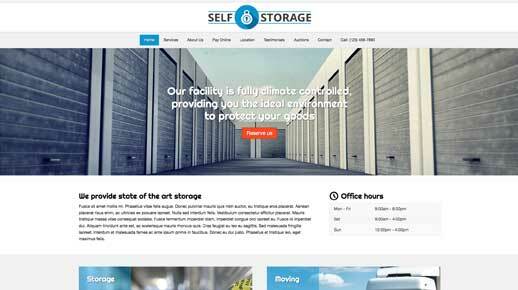 The Self Storage WordPress Theme has an extremely powerful website builder integrated into it. 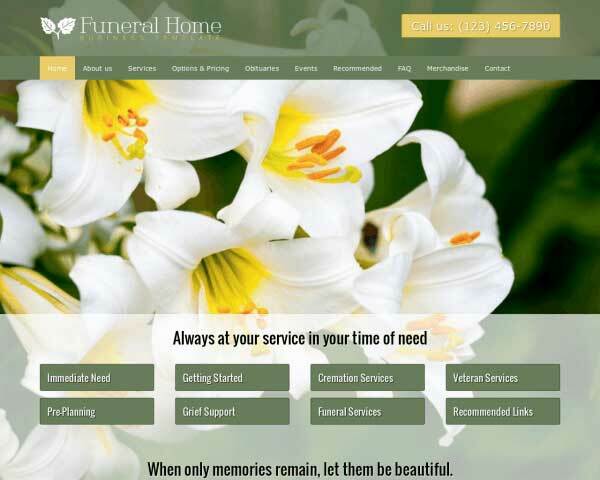 With it you can change each part of the website and, among others, flesh out fully detailed service pages. Besides the great call-to-action above the fold on the homepage, there's also an eye-catching version at the top of the sidebar. This way you ensure that people will know exactly where to go if they want to get into contact with you. If you're using a payment provider like ClickandStor.com we've added a page for your convenience so you can link directly to their website. Anything we can do to get you online as quickly as possible. Information about gate access, a Google Map, location features and storage unit metrics can easily be added and maintained on the Storage Location page. 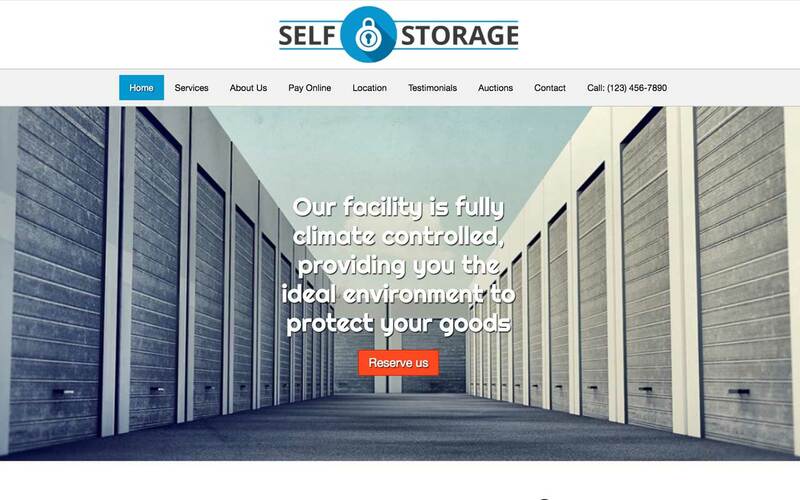 Another great content feature of the Self Storage WordPress Theme. What's a good business without a testimonial overview. It can be good for sure, but it's even better with one. That's the reason why we've added a dedicated testimonial section to this WordPress theme. Every so often a storage unit auction comes along. The Self Storage WordPress Theme provides you with the perfect design functionality to integrate auction rules on your website. Transparency about these rules is key. Any website needs a contact section. People expect it to be there. So of course we've added one to the Self Storage WordPress Theme, complete with a working contact form and a Google Map. One handy little feature in this age of the smartphone is the click-to-call phonenumber. In this case in the main navigation. People using smartphones will only have to tap the button to start calling your company. Of course this WordPress is fully mobile optimized. That has been a requirement for years and one we've implemented from the start. 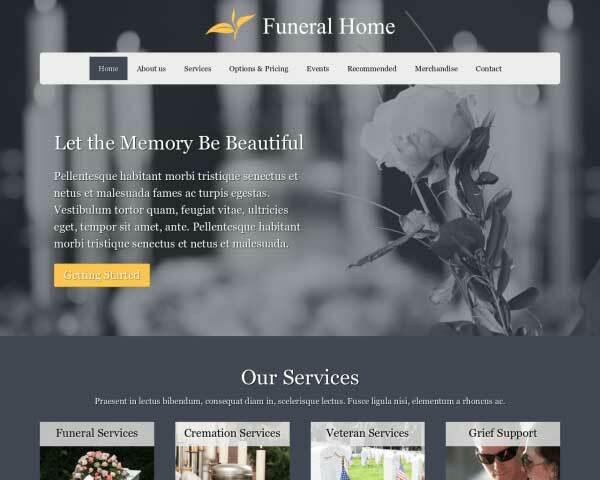 So no matter what device is used to view the storage unit website you're looking to build with this theme, visitors will get the optimal user experience every single time. And there's nothing you have to do about it because the theme's framework will do the heavy lifting. And that's exactly the way it should be: removing all technical complexity so you can focus on getting more clients for your self storage business.